We have been performing at banquets, parties, churches, reunions, malls, stores, hospitals and retirement centers all over the east Texas area and now it is your turn! We sing a capella songs in the barbershop style including comedy, gospel, patriotic, jazz, Christmas, rock & roll and Doo-wop. We will customize our program depending on your needs from a couple of songs to an hour and a half of G-rated family entertainment at a reasonable price. Since we are all retired, we can usually say “yes”, so give Bob a call or send an email and we would love to sing for YOU. An individual and corporate financial support program. The Barbershop Harmony Society, or the Society for the Preservation and Encouragement of Barber Shop Quartet Singing in America, Inc. (SPEBSQSA), was organized in 1938 to promote and preserve barbershop music as an art form. 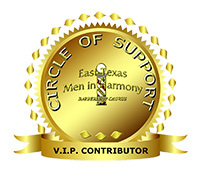 The society now promotes barbershop harmony among men of all ages.